Test firing of the new missile. Photo from January 2015. 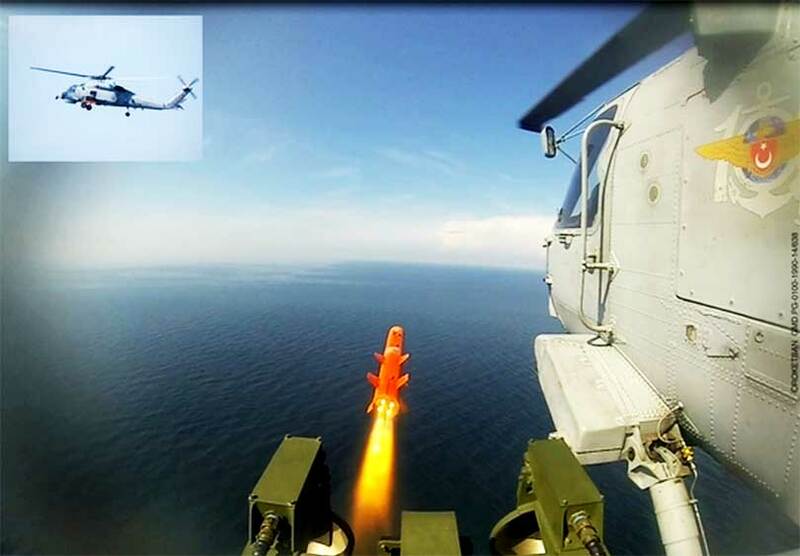 On 28 October 2016, the Turkish Defence Executive Commitee, has decided to arm SH-70B Seahawk helicopters of Turkish Navy with Temren short-range anti ship missile. Temren means arrowhead in Turkish. The missile was developed, from the L-UMTAS long range anti tank missile, developed by Roketsan. The original L-UMTAS has a range of 8 km and weights 38 kg. As is, the Temrem would replace the AGM-114K Hellfire II missiles used by Turkish Navy. But since Temren is a indigenous product, a longer ranged version of the missile with a larger warhead may be developed. The live firing test were conducted in January 2015 and reported here and here. RIGHT NOW THE TURKISH NAVY CAN RECEIVED A BRAND NEW ANTI-SHIP MISSILE.